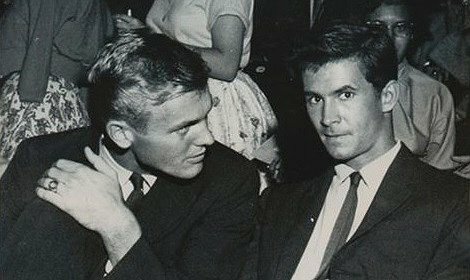 Anthony Perkins and Andrew Garfield look very much alike. And both are super how without being classically handsome or pretty. I agree both were/are hot, but I don’t think they look that much alike at all. It must have been a tough break for Tab when Tony got the role in “Fear Strikes Out” because Tab was much more athletic, but actually, Tony was the better actor. It was actually a major betrayal on Tony’s part. Tab had played the roll on stage and was working to get the studio to make the film for him when Tony snagged it for himself. “Fear Strikes Out” was never adapted to a stage play. Tab Hunter played the role on a half-hour TV adaptation, part of the “Climax!” series, before the movie was made. Whether it was a “betrayal” or not I leave to others. Perkins was “eerily” hot to this closeted teenage tv watcher back in the early 80’s. By this time, Psycho was legend – and showing up on late night tv. Hunter was before my time, however. Very proud of them both! ???? Anthony Perkins always had a certain brooding charm, but Tab was unnervingly beautiful. In some photos he is so beautiful that he almost doesn’t look real. And that body. Perkins was more the skinny, thoughtful type while Tab was the wholesome boy next door. Too bad Tony had to marry a woman. I hope it wasn’t societal pressure that lead him to it. The best actor to be Perkins is the great young actor Andrew Garfield. I think of Anthony each time I see Andrew Garfield. For the stunningly beautiful Tab, only a Colton Haynes, with his perfectly beautiful yet wax-like perfection of face and body, could work. The rest of today’s young male actors are scruffy messes. None of them are pretty enough except for a few who are both physically and spiritually wrong for the part. None of them IS . . . I have the documentary at home. 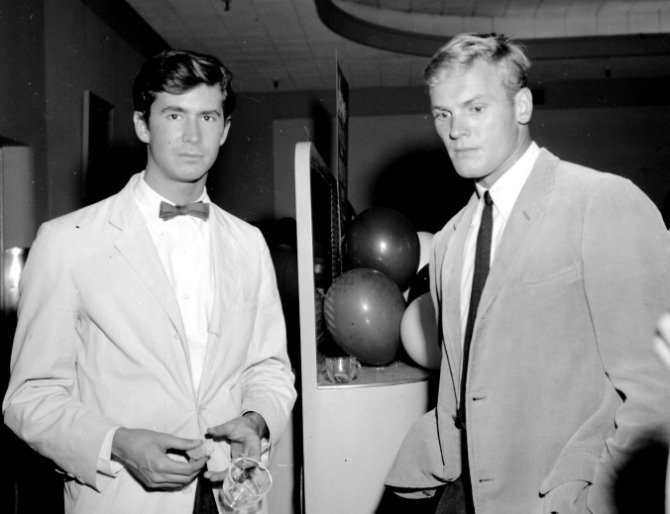 When I first watched it, I kept thinking how good looking Tab Hunter still is. Dorian Grey came to mind with me asking if Tab has a portrait up in the attic! Dont think Andrew Garfield anything like Perkins except that both are tall and skinny. But isn’t that the trouble making movies about icons, they are icons and I don’t think we have any any more. Not in movies anyway. A TV movie last year with Helena Bonham Carter playing Elizabeth Taylor was awful, as Elizabeth had so much charisma, and those incredible eyes. Chris Hemsworth has loads of charisma, but though he could read the phone book and I’d pay to watch him do it, he’s not an icon.